To mark the World Series of Boxing (WSB) going to Wales for the British Lionhearts top-of-the-table clash with the France Fighting Roosters at the Newport Centre on Saturday 14 April 2018, GB Boxing is running a series of #WelshGreats interviews on its website over the next two weeks. Tickets for the match are on sale now, priced £16.50 at www.gbboxing.org.uk/tickets. #WelshGreats will feature boxers from Wales that have competed with distinction for GB Boxing and the British Lionhearts over the last 10 years. First up, is the man dubbed ‘The Welsh Wizard’, Joe Cordina. 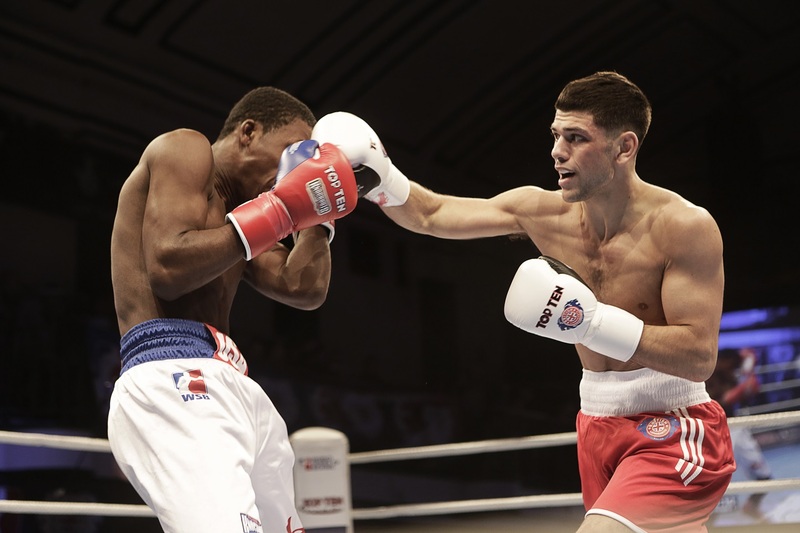 Born in Cardiff, Joe Cordina started boxing aged 15 and was a product of the highly successful St Joseph’s ABC in Newport, run by Tony Borg. After winning the first of many national titles, he joined the GB Boxing squad in 2010. Joe was the first British boxer ever to appear in WSB when he defeated Eric Fowler in the British Lionhearts debut appearance in the competition in November 2012 when they defeated the USA Knockouts, 4-1, in Orange County, Los Angeles. He won a bronze medal at the Commonwealth Games in 2014 and in August 2015, he defeated Otar Eranosyan of Georgia to be crowned European Champion. He went on to qualify for the 2016 Olympic Games and represented Team GB in Rio. He left the GB Boxing squad after Rio to join the professional ranks and has won his first six bouts. On Saturday 31 March 2018, Joe will box on the same bill as his former GB Boxing teammate Anthony Joshua, at the Principality Stadium in his hometown of Cardiff for the WBA International Lightweight title against Andy Townend. How do you look back on your time in the GB Boxing squad? I loved every minute of it, it was a great experience from start to finish, from when I started being around the likes of Tom Stalker, Luke Campbell, Kal Yafai, Anthony Joshua and all those sort of guys. To moving onto being on the podium squad and seeing all of the youngsters coming through, I really did love every minute of it. Time has gone so fast, I was looking at the guys snapchats from the Welsh team who are out in Australia already and just thinking how fast time goes. What was your career highlight as part of the GB Boxing squad? Winning the European gold was massive and one of the main goals for me. But then there is qualifying for the Olympics, which is huge and is what we were all there for. It would definitely have to be one of those two. You were part of GB Boxing during a really successful period – what do you think were the reasons for that success? The coaching. I think when Rob McCracken came on board a lot of things changed. The squad was kind of stuck in the old school style before he came on board; when he took over he brought GB Boxing back to life. Everyone trusted in his methods and how he structured the squad. The coaches that were on there, Lee Pullen, Dave Alloway, Paul Walmsley and all of the other trainers, they were a massive part of it. Which coaches did you work with and how did they develop you as a boxer? The main coach I worked with, as I got on the development squad with him, was Paul Walmsley. He was always in my corner, as well as Lee Pullen. I worked with all of the trainers though and each one taught me something different. It was a massive help having all of them input into developing me as a boxer. How did you find competing in WSB? I loved the World Series of Boxing (WSB) and it really helped my development, particularly now I am a professional. I had four fights in WSB and it has helped to point me in the right direction and helped me to be more comfortable as a professional boxer. The ring walk, the build-up and even fighting the longer rounds, it’s just stood me in really good stead as my career has developed. It’s got to be my first bout, because I was the first ever boxer from GB Boxing to compete in a WSB match. It was in LA, in Orange County against the USA Knockouts and we won 4-1. The GB Boxers on the team was myself, Sean McGoldrick and Antony Fowler and we all won. Are you familiar with any members of the current squad and are there any would pick out as ones to watch? I pretty much know all of the squad members, especially the ones going to the Commonwealth Games, I’ve been to tournaments and trained alongside a lot of them. England, Scotland and Wales have all got a very strong teams going into the Commonwealth Games. From the actual GB Squad I’d say to look out for Pat McCormack, he’s one unbelievable fighter, Galal Yafai, Frazer Clarke, Ben Whittaker, Mickey McDonagh, Luke McCormack, Calum French, they’re all really great fighters. I think most of those GB fighters will get a medal on the Gold Coast. How have you found the transition from being part of the squad to being a professional boxer on your own? I miss the environment quite a lot really, been around the likes of Galal Yafai, Joshua Buatsi. I still see some of my old GB teammates on a regular basis as they are also professional boxers now; guys like Antony Fowler and Lawrence Okolie. From the squad I speak to Galal Yafai and Frazer Clarke quite often. I do miss it a lot though, as you go from being in a squad with lots of other guys to working pretty much on your own as a professional. I am glad that I embraced my time on the squad. Richie Woodhall (Consultant Coach to GB Boxing) used to say to me all of the time “when you leave that’s when you’ll realise how important this was and how this is the best time of your life” and he was right, he was definitely right. What has been the biggest difference between Olympic style boxing and professional boxing? I think it’s the training, it’s a lot longer, whereas as an amateur, everything is more short, sharp and intense, in professional boxing everything is a lot longer. The sessions are longer, sparring is a lot longer, everything is just more spread out. I am boxing on 31 March on the Joshua v Parker bill. It will be for my first title, which is the WBA International Title. It’s in Cardiff, which is my hometown, so I really could not ask for more. For me, it’s perfect.